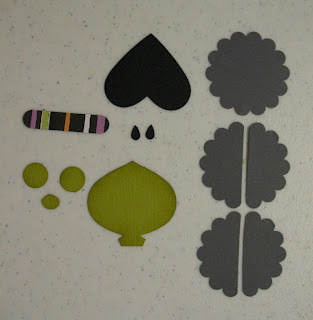 1) Cut out window box sizzix die in choice of double sided paper or cardstock. 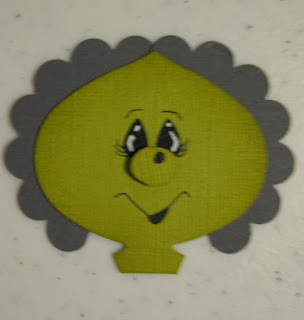 2) Punch out ornament and 1/2" circles in kiwi kiss (or old olive). Trim one of the circles into an oval shape for the nose. Sponge the edges of the pieces in kiwi or olive. 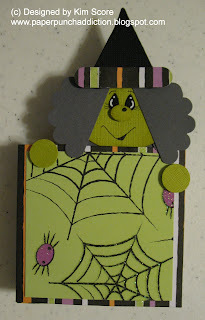 Attach nose with a dimensional or glue dot. Glue on teardrop eyes (martha stewart). Draw details on face with zig and add white highlights with uni-bal gel pen. 3) Punch 3 scallop circles in basic gray. Cut 2 circles in half. Glue 2 cut pieces on the back of head on each side. Glue other 2 cut pieces on front of head. 4) Punch heart out of black. 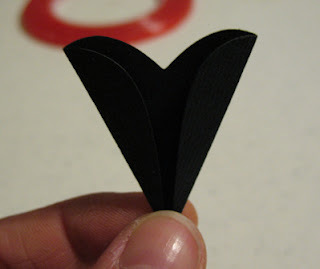 Fold the sides of the heart towards the center to create the hat. Glue sides in place. 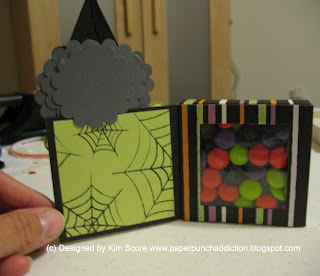 Punch brim with word window punch either black or print paper. Attach brim with dimensionals. Glue hat onto head. 5) Glue head onto to box (from back of the front box flap so that the "neck" doesn't show. Glue 3rd scallop onto back of witch head. 6) Attach the other 2 circles for hands with dimensionals. WOW!! What an AWESOME tutorial!! Thank you for the details. This is GREAT!! Oh, my goodness...how stinkin' cute! Love it!